Ten Ren's Tea Time College Park, originally uploaded by ShashiBellamkonda. This seems the closet restaurant to University of Maryland College Park. I went there one evening on a Monday. 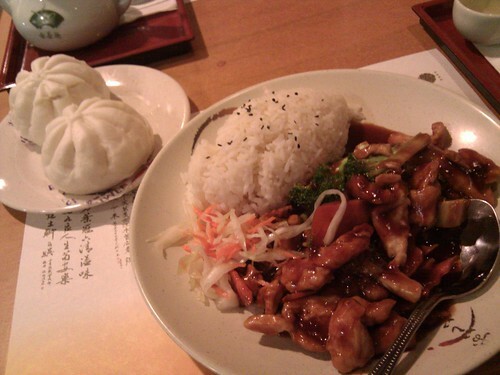 This picture is of Szechuan Chicken with Rice and a vegetable bun and we ordered Jasmine tea. This place is for college students and judging by the friendly service folks by college students. Very reasonable price i.e my chicken dish with rice was $5.95. What they could improve is making the dishes hot including the bun that is luke warm. Did not look like much cooking is done in the evening and maybe these are preprepared. I still think this is a good place and I would go there again. i realize the clientele is college students and the restaurant has to keep the costs low to keep the menu price low..